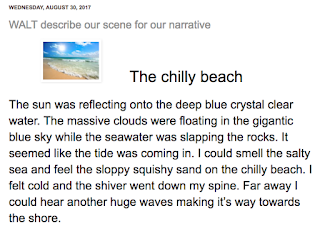 The purpose of this lesson was to encourage students to write narratives that will captivate the reader's interest. To do this I wanted them to analyse samples of writings using a rubric. The process allowed them to have a look at how teachers would be marking samples. It also gave them an insight into what they usually miss doing when writing as they were not aware of the progressions in the rubric. Now when having looked at the rubric, most of them have set a higher goal for themselves and are trying to achieve it. The lesson is done in 2 sessions. Session 1 is on how good planning leads to good writing. 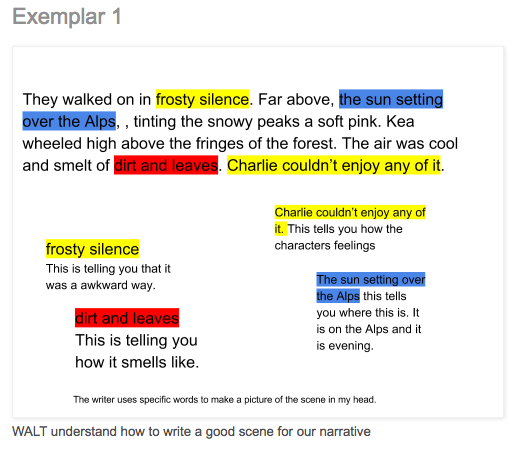 The focus is mainly on collaborating ideas to give more depth to writing. The second session is on using a rubric to analyse writing. Click here to view this lesson. 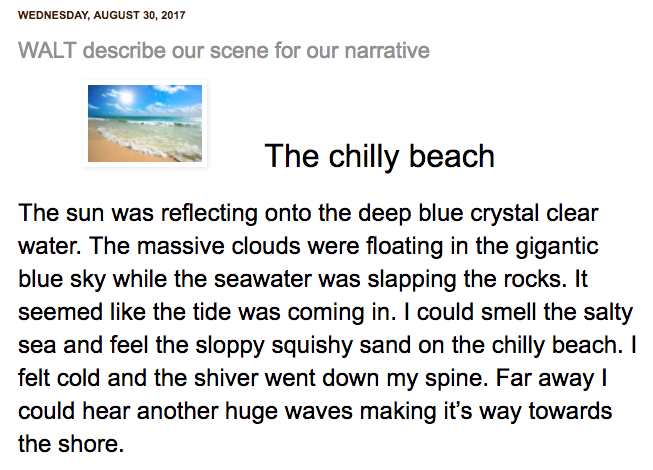 Through this lesson I have tried to extend students’ writing by encouraging them to write captivating stories for their audience. Till now most students in my class have been writing narratives without much detail. One of the reasons why I do not see the trend changing is because I need to focus more on vocabulary that children need for their writing. An attempt has been made to collaborate so that students get more ideas of each other to write a detailed narrative. I have also tried to extend them by using dialogue in their narratives. At the end of the lesson, some students used the dialogue and some forgot, so I reminded them to use the dialogue they had written in their plans. My students still need a lot of practice to fluently use appropriate dialogue in the correct place, in their writings. At present, they are randomly inserting dialogue anywhere they please. So I will read them books during Teacher read time. The purpose will be to draw their attention to how the author uses dialogue to enhance meaning. I would do this through a strategy known as 'think aloud'. I was pretty pleased with the group of students who had their first attempt at analysing a piece of writing written by one of their classmates. I did not disclose the name of the student whose writing I had used for the purpose of moderation. It was interesting to see how they collaborated and discussed with each other when moderating the sample. They all decided on a mark and gave reasons on why they think that mark should be given. This was a moment when I felt very successful as a teacher. I was proud of them. This exercise has also given me an indication that some of my students are ready for further extension. 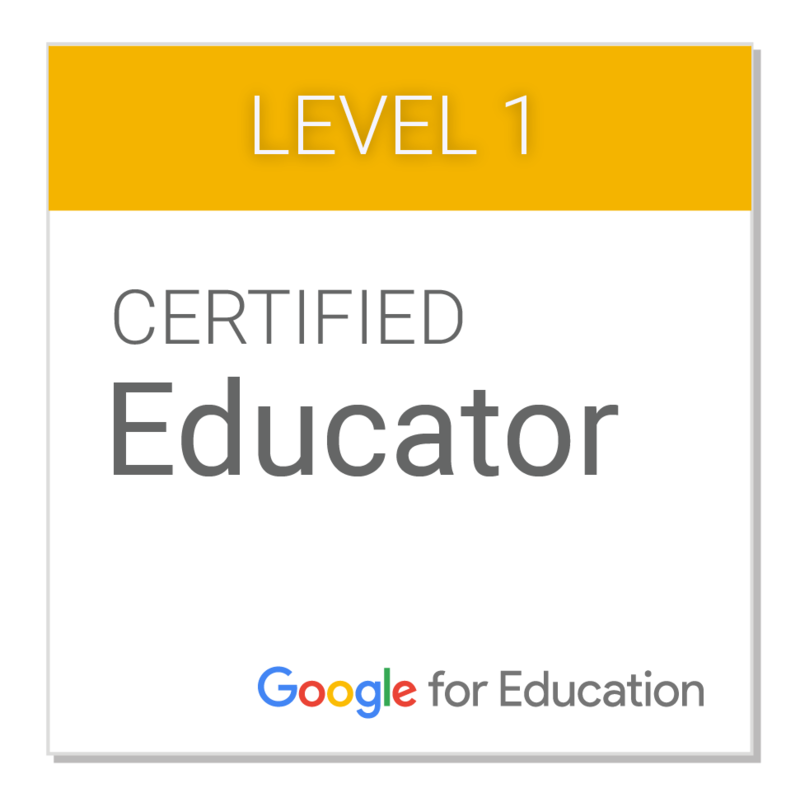 Engaging student using digital tools. I have a student in my class who has very different needs to the rest of my class. For the purpose of this blog, I will call him 'Manaki'. Manaki is currently well below the standard and does not like to engage in reading and writing. It is very tedious to make him complete his tasks in class as he demands one on one attention all the time. This term at a Manaiakalani Hui one of the MIT teachers showed how he used voice typing for his reluctant writers. I will take this idea and see how Manaki responds to it. So what does Manaki like to do? Watch videos about dinosaurs, aeroplanes and whales. To talk about the topics of his interest. What will I do to this term to engage him. 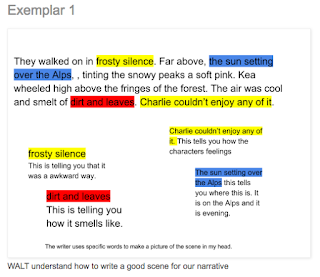 Use voice typing to help him write his stories. Share videos about his interests with him. Let him build things with lego. So I started by teaching how to write a good setting for narratives. First I used an exemplar from a Junior journal that they analysed. We focussed on sense words like what can we see, hear, smell or feel. Then students used pictures to write a setting for the different scenes. I need to teach every little step of narrative writing in detail. My students would benefit from modelling, learning, creating, sharing, analysing and being able to give feedback to one another on their work. I need to keep revisiting what student learn during their writing sessions so that do not forget what they learn. I also need to provide them with a good bank of words so that they feel comfortable expressing themselves when writing.